The Patient’s Medical Home (PMH) model is the future of family practice in Canada. It’s a way for family doctors and their colleagues in other health professions to work together to provide comprehensive and compassionate care when and where it’s needed – and to meet the health care needs of the broader population. In this vision, every family practice across Canada offers the medical care that Canadians want — seamless care that is centred on individual patients’ needs, within their community, throughout every stage of life, and integrated with other health services. The trusting relationship built with patients over time can produce better health outcomes. A growing body of evidence points that PMH-aligned models of care lead to better care, decreased costs to the healthcare system and higher satisfaction for both providers and patients. When patients experience coordinated care by health teams, their satisfaction is greater with overall care and the provider. The PMH is also designed to help family physicians better coordinate programs and services for their patients. While many family doctors provide comprehensive care regardless of their practice design, the PMH can serve as a reference to enhance care for patients. The Alberta College of Family Physicians (ACFP) continues to advocate and work alongside government and health organizations in Alberta to ensure that the resources and supports are in place to advance this vision. Since the original PMH vision was launched in 2011, progress has been made across the country—the provinces that have well-structured, long-term health care system reforms in place are performing the best. All provinces have shown progress in adopting the team-based, patient-centred, continuous, comprehensive, and accessible vision for primary care aligned with the PMH, but there remains an opportunity to do more. The PMH 2019 captures the evolution of family medicine and refreshes the vision for the road ahead for family practices, their patients and policy makers. The full version of the PMH 2019 vision includes detailed background supporting the ten pillars and supporting recommendations. It is meant to strengthen the key PMH goals and provide an updated set of criteria to strive towards. Download the pdf to read more. The College of Family Physicians of Canada (CFPC), in partnership with its provincial Chapters, is pleased to release The Patient’s Medical Home—Provincial Report Card 2019. 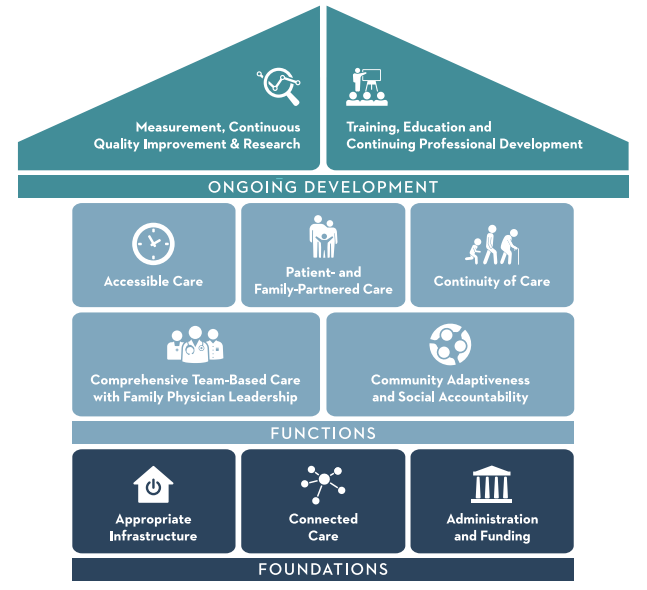 This report summarizes and grades the development of each of the 10 current PMH pillars in each of Canada’s 10 provinces. Here is how the provinces are performing in the PMH pillars. New Video: It Takes a Team Take a look at a PMH in practice at the Calgary Crowfoot Village Family Practice.